The band "Howling at Ravens" consisted of Allan Moller, Chris Knowles and Ben Walker, and together they combined a rich mixture of musical talent and experience. Main instruments are uilleann pipes, flute, celtic harp and bouzouki. 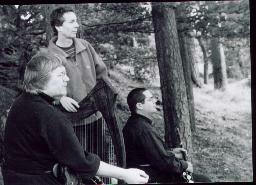 .. "THIS IS A WONDERFULLY ESOTERIC CD OF MOSTLY TRADITIONAL CELTIC MUSIC... THERE ARE 14 TRACKS ON THE CD RANGING FROM JOYOUS JIGS, REELS AND POLKAS-SOUNDING AT TIMES RATHER LIKE THE BOTHY BAND OR THE FINEST POSSIBLE TRAD-SESSION YOU COULD IMAGINE... OTHER TRACKS HAVE AN ETHEREAL QUALITY, PARTICULARLY 'THE DELIGHT OF THE SPINNING WHEEL', TAKEN FROM AN ANCIENT WELSH HARP MANUSCRIPT. BEN WALKER'S FLUTE PLAYING IS REMINISCENT OF THE GREAT MATT MOLLOY. I ALSO REALLY ENJOYED...THE GREEN FIELDS OF CANADA, A SLOW HAUNTING AIR WITH A DISTINCT BLUESY FEEL. FOR MUSICIANS AND ALL OTHER INTERESTED PEOPLE, THE CD SLEEVE NOTES GIVE DETAILED DESCRIPTIONS OF ALL THE TUNES' ORIGINAL SOURCES.. WHAT MORE CAN I SAY! 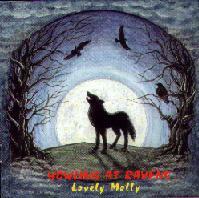 LOVELY MOLLY IS SIMPLY THE BEST ALBUM OF TRADITIONAL CELTIC MUSIC THAT I HAVE HEARD FOR A VERY LONG TIME." A band with two uilleann pipers could well be expected to always have the pipes in the forefront of any of the settings. This, however, is not the case. The harp and the flute both have the upper hand on many tracks as will be heard on "The Morning Thrush" and "Planxty Donal O`Brien". "MOLLER, WALKER AND KNOWLES ARE MASTERS OF THEIR CHOSEN INSTRUMENTS AND HIGHLY SKILLED ON THE OTHERS THEY USE ON THIS RECORDING"